The U.S. territory of American Samoa has been a part of the United States for more than a century, yet our federal government denies that people born in American Samoa are U.S. citizens. 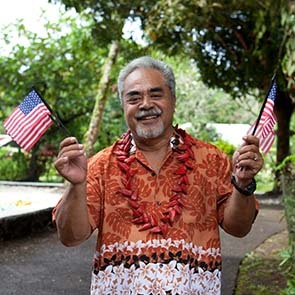 American Samoa's sons and daughters fight and die to defend the United States through extraordinary military service, yet, as a so-called "non-citizen national," a child born in American Samoa is not guaranteed the same rights and privileges as a child born elsewhere in the United States. This is wrong - the U.S. Constitution guarantees that "All persons born... in the United States and subject to the jurisdiction thereof are citizens of the United States." Because American Samoa is part of the United States, I believe it is unconstitutional for the federal government to deny citizenship to persons born in American Samoa. I support efforts to secure recognition of constitutional citizenship for persons born in American Samoa.